This column originally appeared in the Raleigh News & Observer. The claim that North Carolina is undergoing a robust economic recovery brought about by hard policy choices has become a central narrative in the re-election campaign of Gov. Pat McCrory. Yet if North Carolina’s recovery is so robust, why is public enthusiasm for the “Carolina Comeback” so hard to find? Ultimately, the lack of popular acclaim for the “Carolina Comeback” is due to its failure to raise the incomes and living standards of most North Carolinians. 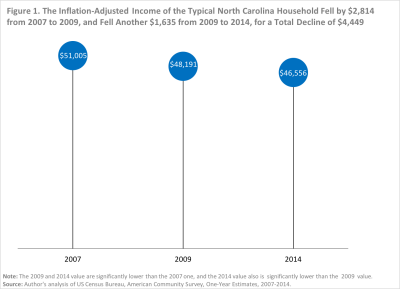 As documented in a set of issue briefs sponsored by the nonprofit organization Think NC First, the available economic data demonstrate that there has been no comeback for the typical North Carolinian, who by and large is worse off today than when the recession began in 2007. Take what should be the central feature of any recovery: widespread improvements in the income levels and living standards of ordinary households. In 2014, the last year with data, the typical (median) household in the state had an inflation-adjusted annual income that was significantly lower than when the recession started in 2007. Over that period, inflation-adjusted median household income fell by $4,449, dropping from $51,005 to $46,556. The income of the typical household fell by $2,814 during the recession and then dropped another $1,635 during the recovery. In short, the typical household lost ground during the recession and then kept losing ground even after the recovery took hold. The fall in median household income levels has affected every major racial and ethnic group, all of which were, at a minimum, no better off in 2014 than in 2007. Specifically, the typical non-Hispanic white, African-American and Hispanic households all saw their incomes fall significantly over that period. And place has provided no protection against falling median household income levels, which currently are statistically unchanged or lower than their pre-recessionary values in 98 of 100 counties.